As a business, Corwin’s is on its fifth generation – family owned and operated for over 150 years. Travis Corwin grew up in this family business, and like the generations before him, he has learned the trade, father to son. Travis is now an accredited jeweler and certified gemologist. As jewelry is the family’s work, we take great pride in repairs and sales alike. Each piece that comes in our door is examined for structural integrity. Many of our repairs can be done in-store while you wait, while other pieces are sent out to our trusted specialists. When it comes to buying the perfect piece, an integral part of our carefully curated selection of jewelry is our extensive estate section. Our expert staff will advise you on quality, longevity, care and maintenance before you buy, and, are adept at working within your budget. We offer a multitude of guarantees and complimentary sizing on pieces purchased from us. Additionally, we provide unparalleled work in engraving and custom design. 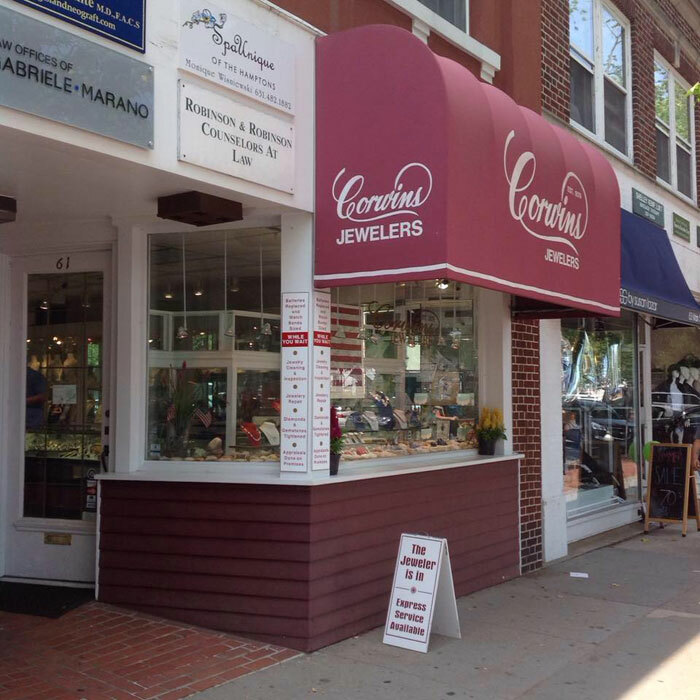 Corwin’s Jewelers has been a trusted and established business for generations. Having been located in the heart of Southampton Village since our opening day it has always been important to us to contribute to the town’s prosperity which is why we participate in local events and organizations, including the Free Masons, the Southampton Rotary, and the Southampton Village Fire Department. In fact, we owe a great deal of our business to repeat customers, and local folks. Just as we’ve known and helped many of our customers for years, we look forward to helping and getting to know you as well.